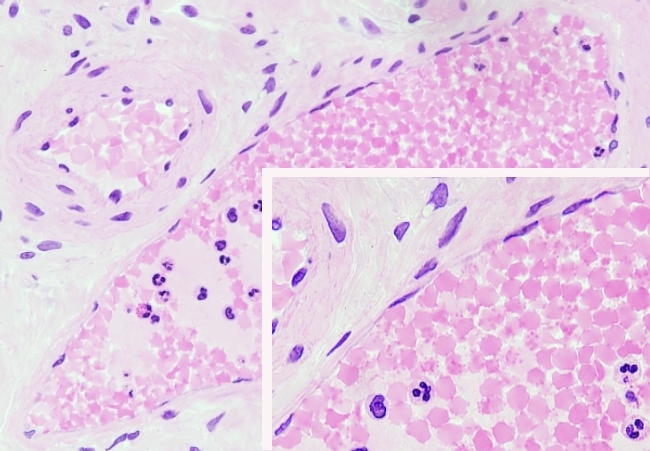 Epithelium: simple squamous keratinized. Atlas of Plant and Animal Histology. Staining: 8 μm paraffin sections stained by haematoxylin and eosin. A cross section of two blood vessels, an artery and a vein, is shown in this image. Boxed image, bottom right, is a magnification of the vein. 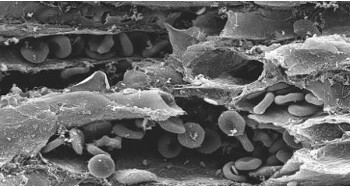 The inner wall of blood vessels is covered by a squamous flattened epithelium known as endothelium. 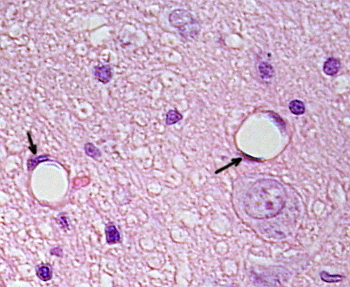 Epithelial nuclei, although very flattened, are the highest part of endothelium. The cytoplasm is very thin and difficult to observe. Inside the vessels, erythrocytes are observed and some white blood cells are seen inside the vein. Drawing of the cellular arrangement of simple squamous epithelium. Squamous simple epithelium is made of just one layer of cells, which show a fusiform shape in cross sections, but they look like fried eggs when observed from the top. Epithelial cells are attached together by large protein complexes known as cell junctions, mainly tight junctions. They force molecules to cross through the cell instead of through intercellular spaces. This type of epithelium is found lining surfaces which are involved in the exchange of molecules. The main function of this epithelium is to facilitate difusion and transport of gas and substances across it. Usually, one of the surfaces of the simple squamous epithelium is facing a cavity or lumen of an internal duct of the body. For example, it allows the interchange of gas in the pulmonary alveoli, facilitates the crossing of the mesothelium by internal fluids, endothelium makes possible the interchange of molecules between blood (as well as lymph) and surrounding tissues, forms the Henle's loop where major part of the kidney filtration occurs, etcetera. 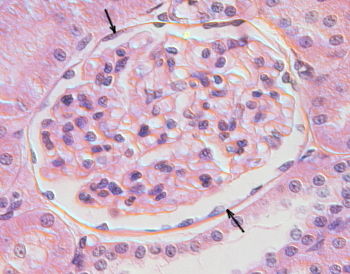 Bowman's capsule of a kidney is lined by simple squamous epithelium (arrows). 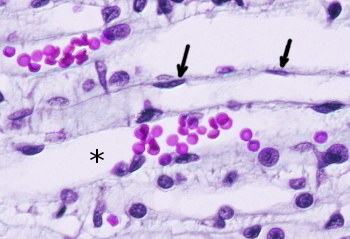 Henle's loop is composed of simple squamous epithelium (arrows). Asterisk indicates a capilar with erythrocytes. 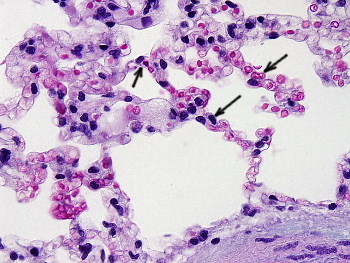 Pulmonary alveoli are lined by simple squamous epithelium (arrows). Endothelium (arrows) of a capillary. 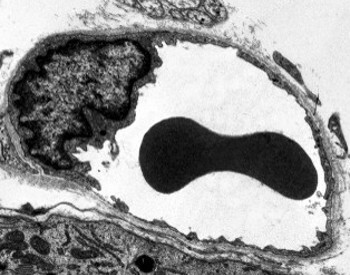 Transmission electron microscopy image of a capillary in transverse view. Simple squamous epithelium forms the wall of the capillary. The endothelial cell cytoplasm is very thin and the nucleus is the widest part of the cell. An erythrocyte is observed inside the capillary. Scanning electron microscopy image showing capillaries with some erythrocytes inside. The walls of capillaries are made of simple squamous epithelium.